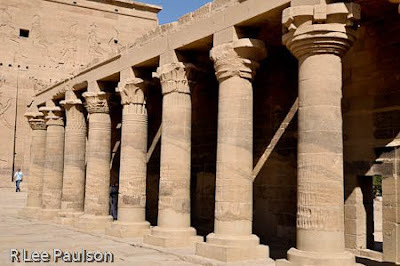 Dedicated to Isis, the site is said to have been used way back into antiquity, though West states that no evidence of prior building was found here. One never knows. I am not sure why many of old Egyptian temples had large pylons out in front. I never thought to ask John Anthony West. 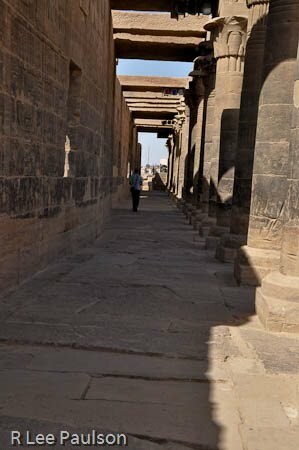 These columns form an outside hallway which surrounds an inner courtyard. 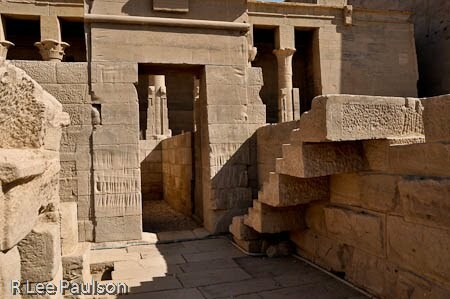 This temple in its current version was built around 650 BC and contains, according to West, the last known sacred hieroglyphic inscription, dated AD 394. We are in the inner courtyard, here, between the pylons. Notice that all of the columns have different decorations. As usual, flash inside the building was prohibited, so all I can show you are shots I took outside. I admit that I was not looking to document the place for a travelogue. Mostly, during the hour we had to explore the place on our own, I was capturing images that happened to catch my eye. he place had a definite feminine feel to it, which is appropriate, since it was dedicated to Isis. After Constantine declared Christianity the state religion for the entire Roman empire in 325 AD, it is said that priests from all over Egypt came here and managed to hold on to their old ways until 550 AD. By 325 AD, it was the end of another era, it was the time of Pisces, the fish, and time for religion to be made available to the masses. Until then, the masses had been shut out of the temples' inner workings. 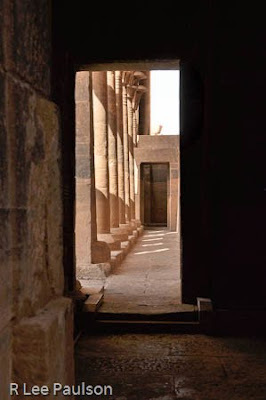 For the last several days, we had been traipsing through the inner sanctums of temples that in ancient times only a select few initiated priests were allowed to enter. As you can see, I appear to have been fascinated by all the different column tops. In ancient times, folks outside the temple were given parables, mythic stories, if you will, to explain the deeper mysteries. But never the underlying principles or details. It was always a two tiered system. We have only been able to glean the extend of the knowledge held by the priestly caste only by reverse engineering the archetectural wonders they left behind. 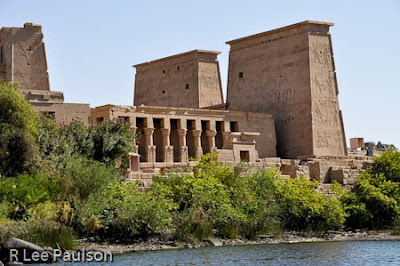 Indeed, if it weren't for Schwaller de Lubicz and his dedicaded 14 years study of the Luxor Temple, we still wouldn't have an inkling of how deep their knowledge went. 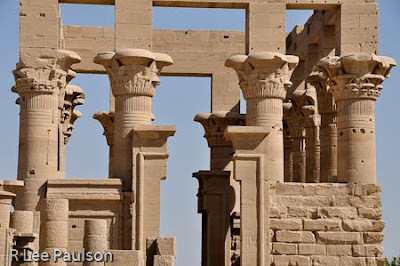 This temple was much smaller compared to the Karnak temple we had seen the day before at Luxor. 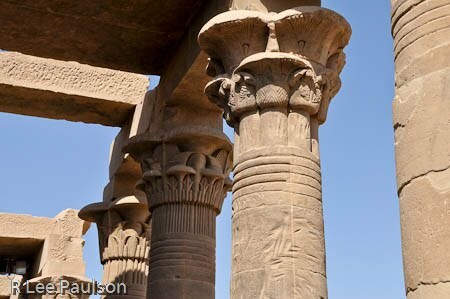 These columns were part of an out building. I have no idea what it was used for. The innermost details of the religious practices were maintained through oral traditions, which is why it is nearly impossible for us to find out what those details were. Only a select few in each generation were carefully chosen from the entire populous to become priests and carry on the tradition. Remember, too, that the inner traditions taught in the temples combined both religious principle and science, mathematics and engineering. And, it was true science back then. There was not the deep divide between science and religion that there is today. This the main temple, again. I loved all the different little nooks and crannies and little rooms opening out onto interesting views. Apparently, it was acceptable to the priests to have the general populous praying to the statues representing the various 'gods'. It would certainly feel demeaning to educated folks in our age to be treated that way. On the other hand, except for the priestly class and the scribes back then, the entire populous was illiterate. Maybe the priests felt that it was simply too difficult to attempt to teach the general populous the abstract principles that today, as a result of our educational system, we more or less take for granted. Like the idea that the two sides of a right triangle squared equal the hypotenuse squared. We'll never know. I am standing on the the wall, equivalent to the top of the staircase looking down on Marcus. 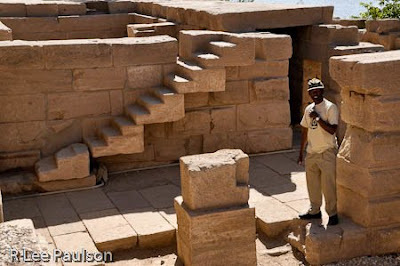 As I found in other places, that staircase seemed to make no sense. It takes one to the top of a covered hallway. 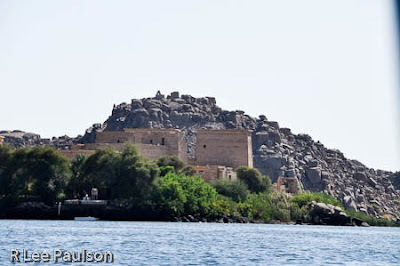 What we do know is the Greek historians who visited ancient Egypt reported that, on the whole, the Egyptian people were the best fed, the healthiest and most content of any country they visited. So, regardless of what we might think of their practices employed by the ancient Egyptians, those practices seemed to have worked for them. Here is the view that Marcus was enjoying before I intruded and took his picture. The ancient Egyptians were used to tearing down their temples and building new ones, along with new myths when the ages changed. So, in many ways, the new Christian religion that was taking hold throughout the region was the appropriate successor to the temples. It was time for everyone to at least have the right to learn all the secrets of the new religion. And, until 325 when the council of Nicaea voted to make the Christ figure divine and dropped the idea of reincarnation, the basic ideas behind the new Christian religion were very similar to those taught by the old Egyptian one. 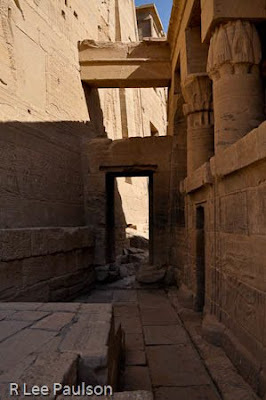 It was said, and I can't remember by who, that because of the similarities, Egypt took to the new Christian religion easier than many of its surrounding countries. The people must have figured that the new myth of the risen Jesus was close enough to those of Osiris, Isis and Horus they had grown up with that one was as good as the next. Especially after 325 when the old religion in Egypt, as part of the Roman empire, became illegal. 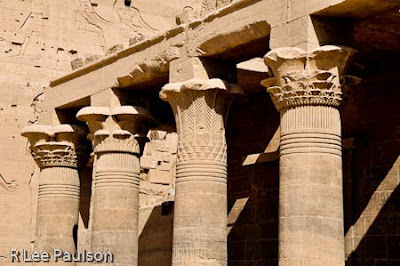 Continue on to Post 36: Philae II by clicking here.